The NCAA college season is about over and the black aces are beginning to arrive. No team was hit harder than Boston University, as the Terriers lost four of their stars to the NHL. Dante Fabbro will be the name every Nashville fan recognizes, but Chad Krys (Chicago) and Joel Farabee (Philadelphia) are great players in their own right. We’ll see how much leash each club gives their player, but all three have some potential to make an immediate impact. BU can’t be happy about this, but they’ve had some very recent practice with losing a stud, Jack Eichel in 2015. I’ve talked about this before, but let’s not expect Dante Fabbro to turn this team around. He’ll likely receive extreme amounts of shelter and limited minutes against top competition, and you know what, that’s great. That’s what should happen. The Nashville Predators should ease Fabbro into the NHL with minimal expectations. No one is going to argue Fabbro’s potential, but right now it’s just that, potential. Let’s not jump down the kid’s throat when he gets exposed or makes a dumb mistake. Those happen to the best of players, rookies or not. 2. What In The Wahlstrom?!? If you’ve forgotten about 11th overall pick in 2018, Oliver Wahlstrom, I would forgive you. He had a lackluster year at Boston College and was rumored to have left early but then stayed to finish the year. All in all, he produced eight goals and 19 points in 36 games for the Eagles. But there’s a really interesting story behind the humble numbers, one brought to my attention by the Athletic’s Nate Wells. Wahlstrom first committed to the University of Maine at the tender age of 13, about five years before he’d be eligible to play. According to Wells, Wahlstrom de-committed half a year later in July of 2015. Although, it would only take a month before Wahlstrom found his new preferred destination, Harvard. That “commitment” lasted about three years, when Wahlstrom decided to forego Harvard before eventually landing on Boston College in May of 2018. He lasted six months in Boston before leaving, which brings us to the present. So, what’s going with Wahlstrom? Arthur Staple of the Athletic has said that Wahlstrom will likely sign an Amateur Try Out (ATO) deal with New York’s AHL affiliate, the Bridgeport Sound Tigers. Nothing is official though, as of Thursday the 28th at 2:30 PM. The reason I share this is because it’s absolutely ludicrous. Seriously, who lets a 13 year old make a commitment like that? I knew tons of young teenagers that showed great promise but never reached their potential. It just feels like a huge oversight on the NCAA and the people Wahlstrom put his trust in. If you take one thing away from this part, let it be this, don’t let teenagers make long lasting decisions. 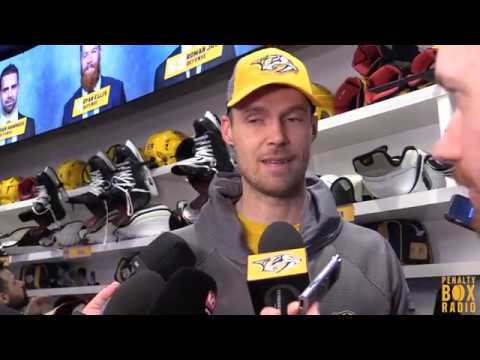 Everyone will know at the time of this article’s publication, but Pekka Rinne has new pads. They’re navy blue, and I only have one thought, make your entire kit navy blue. I love Juuse Saros, but his blue helmet and gold pads are a terrible look. If you’re going to do something don’t go halfway. Give us a full navy or golden kit, you cowards! I remember a simpler time in the NHL, about two months ago. All I wanted was for Mark Stone to be released and play for a team that had a chance at winning. Then he came to the Vegas Golden Knights and I immediately regretted even hoping for him to leave Ottawa. He’s been an absolute monster so far and it looks like it’s put Vegas over. They’re not in the Tampa tier, but they’re close to the lead in the second one, next to Toronto, Boston, Calgary, Winnipeg, and Nashville. When Stone is on the ice, Vegas controls 57.49% of shot attempts, 58.64% of shots, 58.24% of scoring chances, and 63.51% of high danger chances. He currently has eight points in 13 games, but could easily have more if he wasn’t playing against top competition every night. It feels like Stone is finally getting the recognition he deserves, and it couldn’t have happened to a better guy. I know it might be too early to look to the off-season, but I can’t help but think of some soon-to-be free agents. Everyone knows about the big ones, Artemi Panarin and Sergei Bobrovsky, but there are a few lesser known agents that could make a real impact. Before I mention who I want to, I should talk about Matt Duchene. He’s talked about wanting to come to Nashville and how much he likes it, but I wouldn’t expect him to take a discount. He has no reason to be loyal or take less money, and with good reason, what have the Predators ever done for him? I expect teams will likely throw nine million dollars per year at him, and the lowest I can imagine him accepting is eight million. Could the Predators afford that without making moves that would shake the team up? Anyways, the player I’d like the Predators to take a gamble on is Jordan Eberle. He’s coming off a down year with 15 goals and 32 points in 73 games, but he’s a proven goalscorer who could easily pot 30 if placed with the right linemates. His current deal that ends after this season is worth six million per, but I could easily see that price drop after a lackluster season. There’s a chance the Predators could get him for around five million, which would be a great boost to their second line. Otherwise, Gustav Nyquist and Andre Burakovsky could be great pickups, although I suspect Burakovsky won’t make it to July 1st.